6TH ANNUAL STUDENTS’ SCIENTIFIC CONFERENCE ON AMERICAN STUDIES "
CALL FOR PARTICIPATION - 6TH ANNUAL STUDENTS’ SCIENTIFIC CONFERENCE ON AMERICAN STUDIES “U.S. FOREIGN POLICY SINCE WOODROW WILSON’S FOURTEEN POINTS SPEECH”. Since 2013 student conference on American Studies is organized annually by the Institute of American Studies, Georgian Association for American Studies and American Studies Students’ Scientific Group at Ivane Javakhishvili Tbilisi State University. Each year we host BA, MA and PhD students and faculty from the various disciplines interested in or doing major / minor in American Studies to meet and exchange academic, research and professional knowledge in the field of American Studies. On April 30, 2018, the Institute of American Studies, Georgian Association for American Studies and American Studies Students’ Scientific Group at Ivane Javakhishvili Tbilisi State University will be hosting 6th annual student scientific conference on American Studies on topic “U.S. 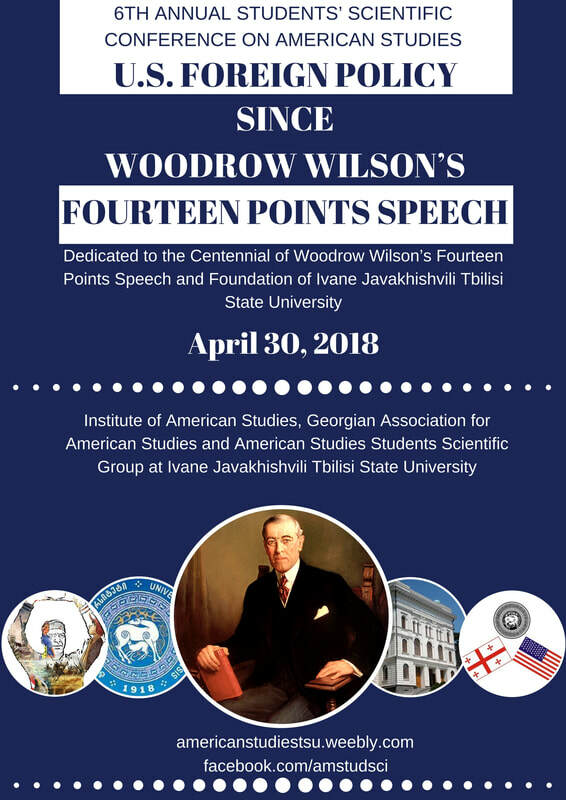 FOREIGN POLICY SINCE WOODROW WILSON’S FOURTEEN POINTS SPEECH” dedicated to the centennial of Woodrow Wilson’s Fourteen Points Speech and foundation of Ivane Javakhishvili Tbilisi State University. We invite BA, MA and PhD students with different academic disciplines to participate in the conference. High preference will be given to the students doing research in U.S. Studies, Latin America Studies or doing major/minor in American Studies. Note: References should be formatted in the Chicago Style of Citation. Conference working languages are Georgian and English. Interested applicants should indicate “Conference-2018” in the subject line. After the selection, if the foreign student cannot manage to attend the conference, organizational committee will consider the other ways for participation, including but not limited to the Skype live conference. For more information please contact Mariami Khatiashvili, Chairperson, American Studies Students Scientific Group.